Construction Waste Management – To earn a credit in Construction Waste Management the project must Divert construction waste from landfills towards recycling or reuse. 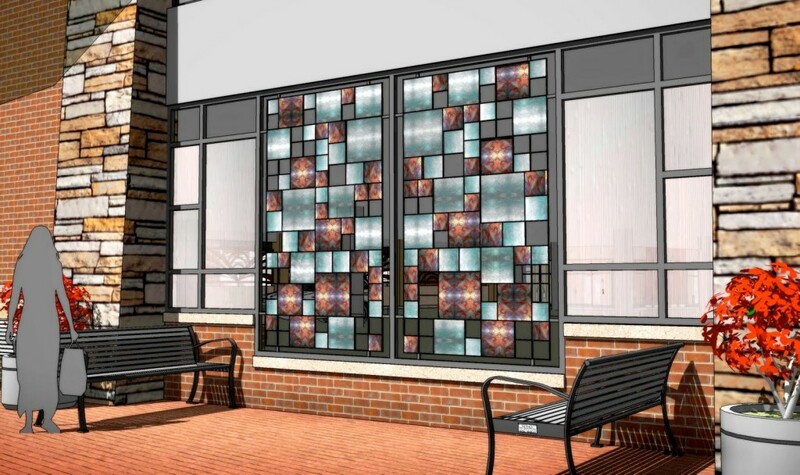 Example: The artist, Erwin Timmers, dug through the site demolition to remove glass for this 30 feet long by 9 feet high artwork. The recycled glass was then melted down and recast into the new colorful forms. 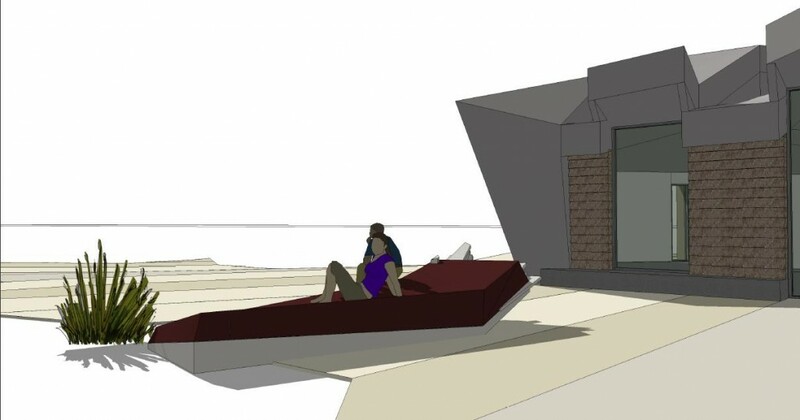 Example: Didier Hess’ Orit Haj will incorporate rammed earth from excavation of interpretive center, stainless steel rod, concrete and concrete fiberboard scraps from building construction. Rapidly Renewable Materials – are natural materials that regenerate in less than 10 years, like bamboo, straw, cork, natural linoleum products (such as Marmoleum), wool, wheatboard, and strawboard. Certified Wood – And you can use wood if it is a Forest Stewardship Council (FSC)-certified wood product. Low-Emitting materials – If artwork will be indoors the material must have Low or no VOC (volatile organic compound) content. Refrigerant Management – is a great opportunity for glass curtains. Points will be awarded if the project does not increase and/or reduces a building heat load. Example: Architectural material technologists, Decker Yeadon, have developed a material that regulates a building’s climate by automatically responding to environmental conditions, without need of people, or energy intensive machinery. 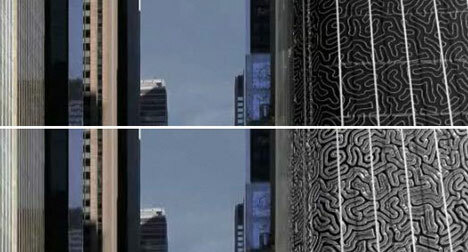 Watch the video to get a real sense of how revolutionary their Homeostatic Facade Systemcould be for building design. 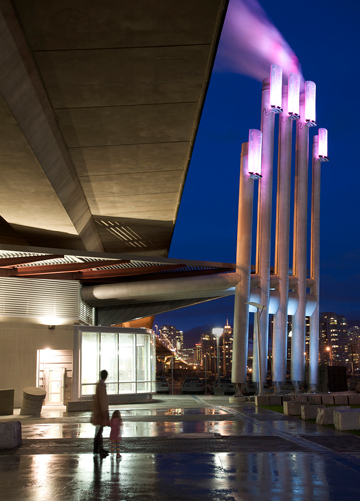 Example: In Vancouver, at the False Creek Energy Centre, public art is activated by the operations of the facility, which produces domestic hot water and space heating for the adjacent community. At the top of each stack is a LED light fixture which changes color from blue – orange – red relative to the heat output of the plant. Example: PIEZOELECTRIC WALKWAYS is a power technology which uses pressure generated by people walking to produce electricity. Toulouse, France is now using the technology to generate enough electricity to run streetlights. 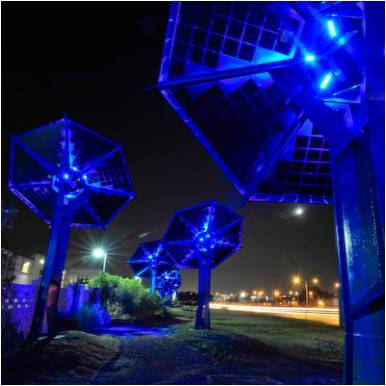 Example: Mags Harries & Lajos Hedder’s SunFlower, An Electric Garden is a public art project in Austin, Texas feeds about 15 KW of electricity into the grid for credit, which funds the maintenance and operating costs for the project. 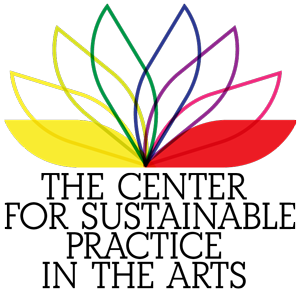 Sessions open to all LDI full-conference badge holders, and four-pack or eight-pack tickets. Bob Usdin of Showman Fabricators kick off Green Day with an overview of what’s happening in various aspects of the industry. GD01 Why Bother? A Session for Skeptics!!!!! Is there a Crisis? The facts are indisputable when you see this evidence. Why is Greening in the entertainment industry important? Beyond just the immediate carbon footprint of an event, talk about the ultimate payoff: Getting your audience to be green in their lives. Learn about the 4-D’s, and how to deal with skeptics. Paul Reale, Chief Executive Officer and Founder of Green Allowance and trained speaker from Al Gore’s The Climate project will present the undeniable evidence from the Inconvenient Truth with updates on today’s global climate. LEED, CRI, Greenguard, FSC, Greenlabel, VOC, MERV, 3 R’s, CFC’s, Carbon Offsets: A whole new language has evolved around greening. What does it all mean? More importantly, what standards are useful for the entertainment industry? We’ll look at how to weigh claims and benefits in materials, products, and practices. What are manufacturers and suppliers offering that are green? LDI exhibitors are invited to showcase their products that can contribute to making productions greener and more sustainable. This roundtable discussion will seek out Best/Better Practices being used around the country, in a completely ‘hands-on’ traditional brainstorming session with post-its and white boards. At the end of the session all ideas will be compiled and posted on a website. Bring every idea to the table no matter how crazy. A look at projects from the past year that incorporated some green projects (productions, events, buildings, theatre companies, etc.) followed by a general discussion of where the entertainment industry can and should go to be green. via 2009 Green Day . 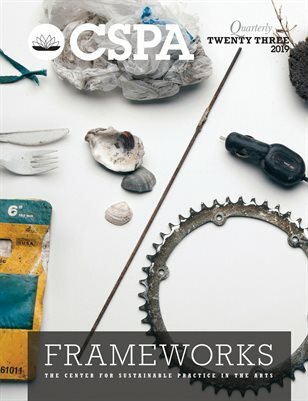 From the Architectural Foundation of Los Angeles: As Renzo Piano suggests, sustainability is the 21st century order for architecture and the built environment-and when exceptional design is seamlessly integrated with new high performance standards for conservation and sustainable building practices are implemented, innovative and sophisticated solutions are the result. This evolution of form is coming of age and changing the landscape one space, one home, and one building at a time. The Architectural Foundation of Los Angeles (AFLA) mission recognizes this metamorphosis of design integrated with the language of sustainability and a spirit of environmental justice. AFLA recognizes both LEED and the Living Building Challenge (LBC) as measures of best practice sustainable design and sees a need to recognize design elegance in that context. The Design/Green Awards were created by the AFLA to honor exceptional design of LEED and LBC projects in Southern California. As with the judging of last year’s entries, this year’s jury will include internationally recognized architects, engineers, and designers. The Kresge Foundation has announced that it will be folding its Green Building Initiative into its existing Environment Program. Whether this was due to a downturn in funding, management consolidation, or a feeling that their efforts were being duplicated by other foundations is unknown. However, funds will remain available for theaters seeking to rebuild or renovate their existing spaces according to the US Green Building Council’s LEED accreditation system. The Kresge Foundation in Troy, Michigan, has announced that it is winding down its green building initiative and has set May 29 as the last day that it will accept applications to cover the planning costs associated with constructing or renovating facilities in an environmentally sustainable manner. At the same time, the foundation has committed to advancing environmental stewardship through its environment program. Launched in 2007, the program is working to reduce greenhouse gas emissions from the built environment, accelerate the adoption of renewable energy technologies, and develop strategies for helping society adapt to the impacts of climate change. Going forward, the foundation will allocate more resources to the program to support policy changes designed to accelerate the adoption of energy-efficient practices in building construction, renovation, and operation. 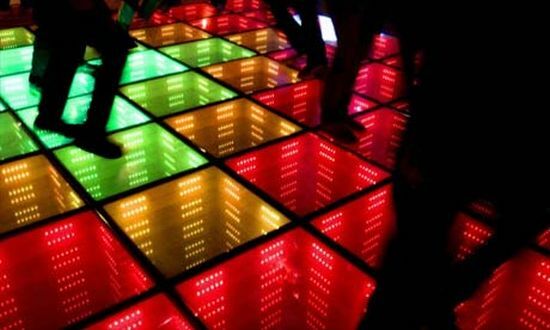 ETC (Electronic Theatre Controls, Inc.) has not only led the entertainment- and architectural-lighting industry in technical innovation but is leading in green practices as well. The company’s environmental policy is ‘committed to fostering a healthy, safe and sustainable global environment.’ ETC meets and exceeds compliance with the European Union’s WEEE (Waste from Electrical and Electronic Equipment) directive — practicing proper recycling of all products, including the disposal of electrical equipment. Within the ETC factory, reusable containers are used instead of disposable ones that produce further waste. ETC also adheres to the European Union environmental-safety directive RoHS (Restriction of Hazardous Substances), which regulates chemicals used in electrical and electronic equipment. On a product level, ETC strives to develop greener, more energy-conscious lighting solutions. The new ETC architectural line, the Unison® Paradigm™ lighting control system, was engineered to regulate energy: detecting occupancy in rooms and automatically lowering light levels in vacant spaces, operating on a programmable timed-event schedule, and through ‘daylight harvesting’ — a light-detection capability that lowers electric lighting levels in response to incoming natural light. ETC’s Source Four® fixtures are known globally for their high energy-efficiency. The Source Four spotlight has become the most efficient tungsten fixture for entertainment lighting — given its patented high-performance lamp (HPL) and dichroic ellipsoidal technology. ETC’s 575-watt Source Four fixtures shine as brightly as competitors’ 1000-watt fixtures — using 40% less energy. ETC also produces a full range of Source Four HID fixtures with high-intensity-discharge lamps that last up to 10,000 hours longer than other lamps, while maintaining over 90% efficiency. ETC’s products and systems are helping customers and their buildings achieve the distinguished Leadership in Energy and Environmental Design (LEED) rating. The largest LEED building, the silver-certified new Palazzo Hotel and Casino in Las Vegas, is equipped with ETC’s Unison system as well as over 100 Source Four fixtures. The Grand Rapids Art Museum, in Grand Rapids, Michigan, the first art museum to achieve Gold LEED certification, also benefits from green-minded Unison control. ETC has gone greener on the homefront too: the recent 78,000-square-foot addition at ETC’s Wisconsin headquarters was designed with minimal environmental impact in mind. ETC’s Unison Paradigm system is used throughout the headquarters to maximize energy efficiencies. In the new construction, thick, heavy-duty metal panels were chosen to reduce excess material consumption. Software connected to the factory’s heating, ventilation, and air conditioning system was deployed to regulate energy use during peak hours to minimize overall energy consumption. ETC also installed a receiving dock equipped with an air lock to prevent temperature-regulated air loss. Doors, windows, and even asphalt materials were recycled during the construction process. The new addition uses electricity-frugal fluorescent lighting and contains eight huge skylights for optimal natural lighting — reducing need for electric light. ETC’s property too is greener than ever, recently re-landscaped with almost 170 newly planted trees that will surround the headquarters with a canopy of natural dimming. In addition to tree planting, ETC is reducing future paper waste internally. The company has started a huge effort toward a ‘paperless office,’ in which all paper records will be transferred into electronically-archived copies. The project will take over a year to complete and will convert over three million pages of data into electronic format. All existing paper will be recycled. Even ETC’s 2009 product catalog too is eco-friendly. The new cover is made from 100% recovered cotton, from textile-factory waste, and the catalog’s pages are made of FSC-certified paper — 30% recycled fiber and chlorine-free pulp from timber-managed forests. The place where I learned my firsts about sustainability AND production in an artistic setting, Rice Univeristy, is building a new LEED certified residential Hall. While Duncan hall will never have the same history as the ol’ Will Rice College, I’m excited to see Rice on this path! This Post was originally posted to Mike Lawler’s ecoTheaer blog on July 19, 2007. We are reposting it here to share this ecoTheater classic with new readers while MIke continues to regain his health. You can read his blog about his ongoing battle with cancer, The “C” Word, by clicking here. Ryan’s admission of TFANA’s initial unwillingness seems to be further indication of a preexisting attitude in the arts. While the typical reaction to green building that theaters and their directors seem to have (so far we can cite Portland Center Stage, American Players Theatre, and TFANA–all initially opposed to green building) may be understandable for the frequently cash-strapped arts organization mindset, it is nevertheless slightly bothersome. So, what is it? In the simplest of terms, it is the money. Michael Broh, production manager of American Players Theatre (APT), told me recently that though everyone involved with their new theater project is happy to consider the green building option, “if it came down to building a less sustainable building, or not building at all,” he said, “I think we would build the less sustainable one.” It is here that APT and I do not see eye to eye. The benefits, in my way of thinking, of adding an indoor space and possibly extending their operating season and expanding their repertoire, are not worth adding another conventional building (or two) to the world to further pollute and contaminate. Isn’t the business of theater dirty enough? Must we add more of them? There must come a time when the artists (and, frankly, business folks) running the theaters own up to their responsibility to their communities the way they would expect any other business entity to do so. With the attitudes that seem to exist–the notion that there just isn’t enough money to build green, to build conscientiously–one can only come to this conclusion: the driving force behind these projects is nothing but self-interest, and perhaps greed. 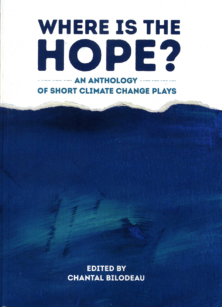 I am convinced that if more theater managers were either forced (as in the case of Dorothy Ryan and TFANA), or just took the time, to consider the long-term advantages of building green, most of them would come to the same sort of revelations that the folks at TFANA did. Perhaps all municipalities can follow in the footsteps of local law 86–there is nothing like folks with money (be they governments or rich benefactors) putting worthy conditions on the money they dole out.